I’m taking a break this week from my usual essays about Pleistocene Georgia to write a travelogue of a vacation my family forced upon me. 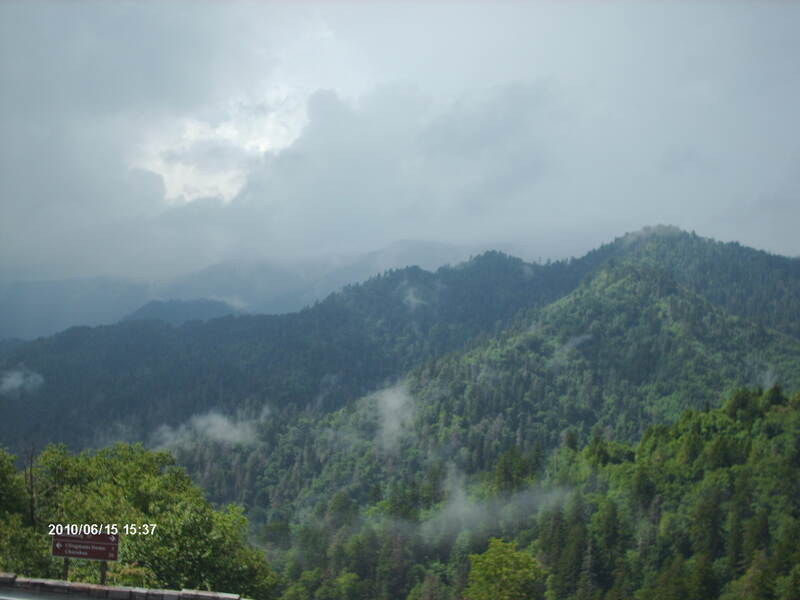 For my daughter’s 15th birthday my wife promised her a trip to Gatlinburg, Tennessee, a crowded tourist trap, bordering the north end of the Great Smoky Mountains National Park, which is itself an overhyped haven for wildlife. The sidewalks are jammed with tourists from early morning till midnight, and they come from all over the world, including Ohio, Louisiana, Iowa, Florida, Texas, Missouri, Japan, and Germany. Little shops and stores, like cigars crammed inside a tin can, stand in line on both sides of the confusing winding streets, beckoning the tourists to throw money their way. There’s a Ben and Jerry’s Ice Cream Store, a Guinness Book of World Records Museum, a wax museum, a celebrity car museum, a hat and cowboy boot outlet, a country western bar, pancake houses and barbecue restaurants, a McDonalds, and untold other high, low, and middle end stores. All this exists but with precious little parking. There are no alleys in between the stores and no parking lots in front or to the sides of the businesses. We found a parking lot in back of one museum that cost us $10. My wife is disabled and I didn’t want to have to wheel her chair across town. Gatlinburg’s not that big–I recommend (if tourist traps are your cup of tea) to hike downtown from your motel, or you can take one of the trolleys. The streets are interspersed with rights of way for walking tourists, but out-of-town motorists don’t realize this, creating a dangerous hazard. Other motorists disregarded the pedestrian rights of way, until they saw me stopping. My daughter chose to throw our money away at the Ripley’s Believe it or Not Museum. I found this freak show rather lame and outdated, but I guess it’s ok for kids. There’s nothing here surprising to a person well versed in science and history. 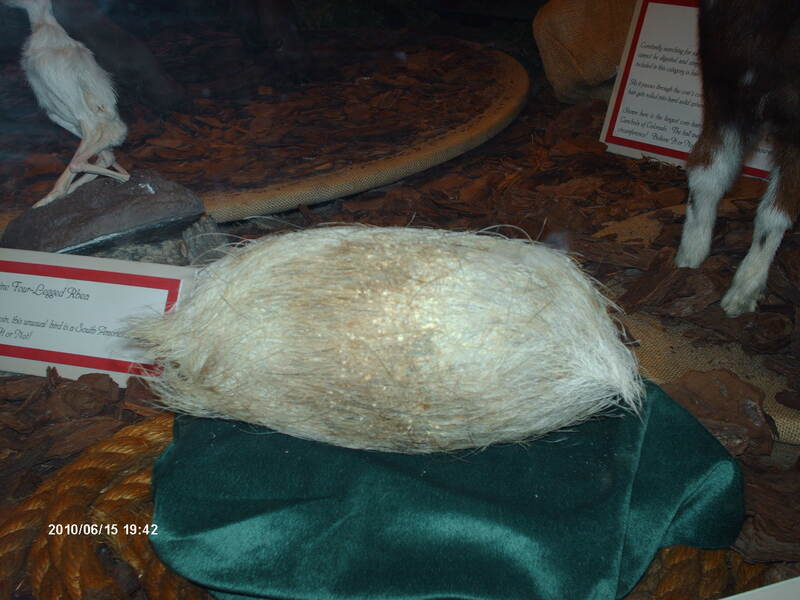 This is a hairball from a pig. The poor animal must have coughed its lungs up to get this out. 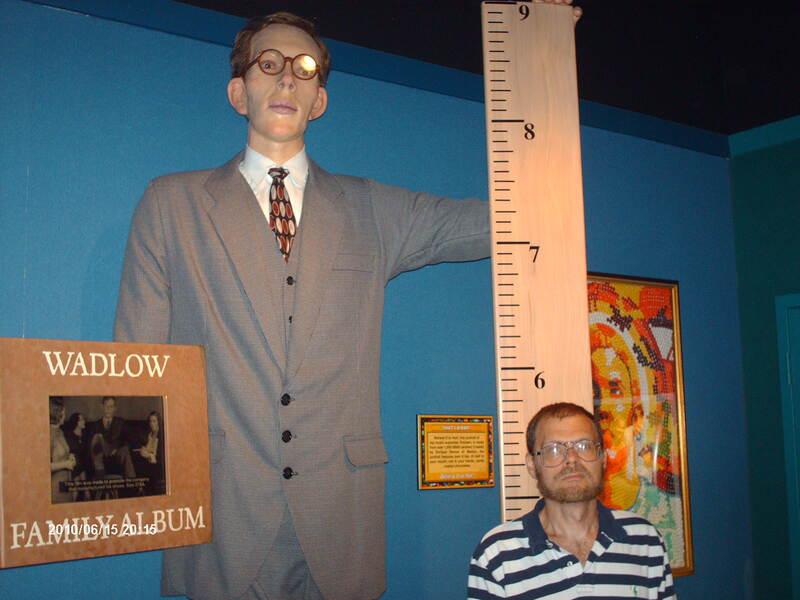 This is a photo of me next to a replica of Robert Wadlow, the tallest man to ever live. In a boxing match between us it would’ve been hard for me to land punches above the belt. 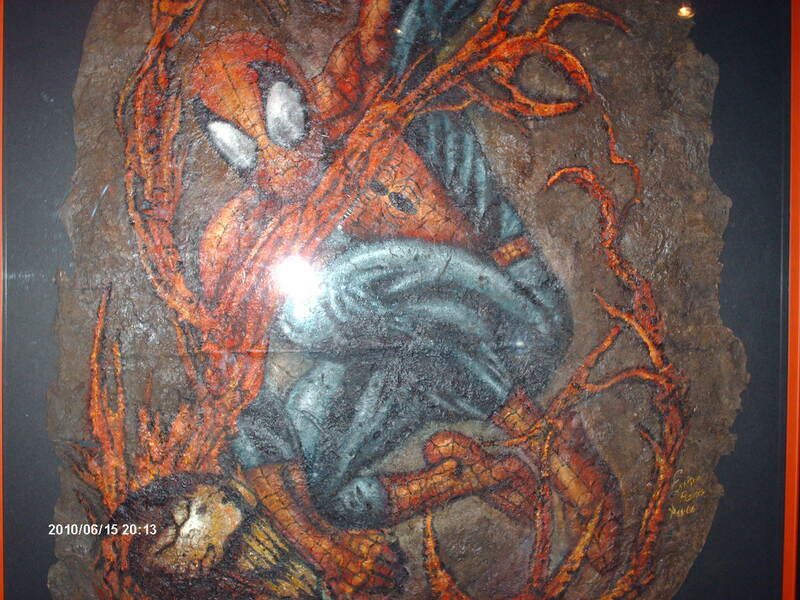 This poster of spiderman is made out of real spider webs. Amazing! 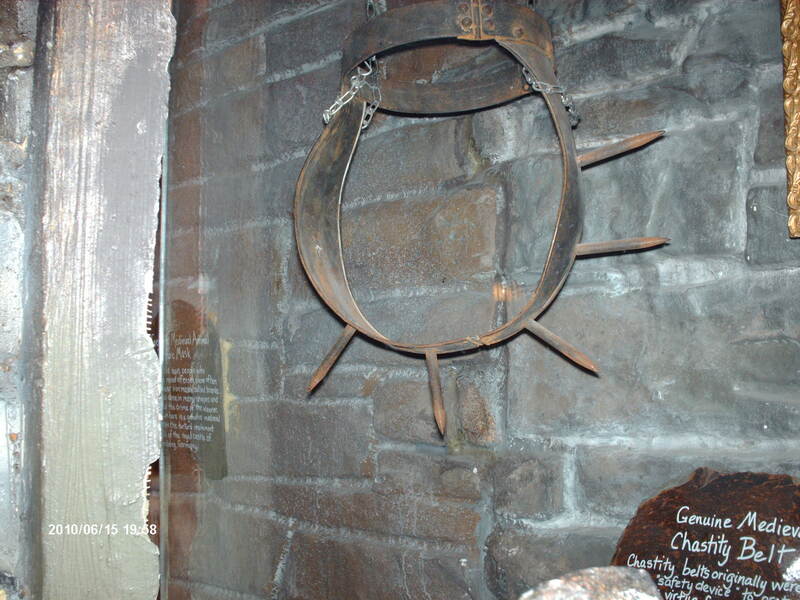 This is a medieval chastity belt. I bet men found a way to overcome this. Where there’s a will, there’s a way. We ate supper one night at the Smoky Mountain Trout House, an overpriced tourist trap restaurant. They serve trout 13 different ways. The sides were nothing special–frozen crinkle cut french fries, the driest hushpuppies I ever ate, and bottled salad dressing. The trout was good–I wolfed down a whole crispy fried one. This was the first time I’d ever eaten a fish with the head left on. I made Andrew Zimmern of the Travel Channel series Bizarre Foods proud when I dared to eat a fish’s eyeball. It tasted strong, much fishier than the flesh, and I could feel the solid texture of the lens on my tongue. I didn’t eat the other eyeball and don’t recommend eating them, unless starvation is imminent. We ate lunch at the Flying Pig Smokehouse. The prices here were more family friendly, and the barbecue genuine. The apple cinnamon barbecue sauce went well with smoky pork. I highly recommend this park for those interested in botany. Situated as it is in the middle of eastern North America and with varying elevations, plant species diversity is high. There are plants that prefer warm climate growing next to species with cold climate affinities, much like what grew further south in Georgia during the Ice Age. I found hemlock, white pine, loblolly pine, white oak, chestnut oak, northern red oak, beech, birch, elm, tulip, red maple, box elder, buckeye, sweetgum, sycamore, hickory, bigleaf magnolia, and black walnut. The large numbers of black walnut within the park boundaries surprised me. This tree’s wood is prized by furniture makers. It’s rare outside the park, though it formerly was a common species of our eastern deciduous forest. 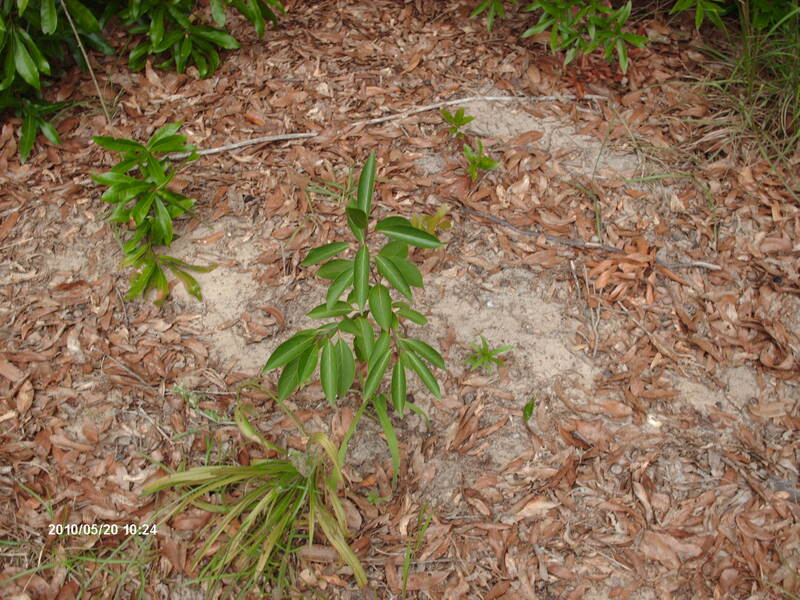 Rhodadendron was common in the understory. This is the view from Newfound Gap. The mountains are literally smoking. Rhodadendron in the center of the photo. This is a potential bear den next to the Appalachian trail. When large mature trees fall, the roots rip up caverns, making it easy for bears and other critters to dig deeper tunnels. This part of the trail was busy and noisy. We were sandwiched between a motorcycle convention in the parking lot and a hiker playing loud music. I do not recommend Great Smoky Mountains National Park for tourists interested in wildlife viewing. By far the most common large mammal species in the park is Homo sapiens–the park is badly overcrowded. The main highway #441 that bisects the park has bumper-to-bumper traffic. I even got stuck in a traffic jam. Supposedly, the park holds 6,000 white tail deer, 1600 black bear, 600 wild boar, and 100 elk. The only mammals I saw were an estimated 40,000 people and one gray squirrel–a bitter disappointment. Supposedly, 200 species of birds reside in the park. I saw 5, and they were species commonly seen in Augusta, Georgia where I live. 95% of the park is a closed canopy forest; the balance is meadow. Some of the forested area is old growth. Large mammal populations are low in old growth forests, and what little lives there is hidden in the trees. No timbering is allowed so mast-producing trees, such as oaks, are being shaded out by less productive trees. Coupled with the loss of the chestnuts to the blight in the last century, this means there is little food available for large mammals. Moreover, most of the areas in the park that are favorable for wildlife viewing were closed. 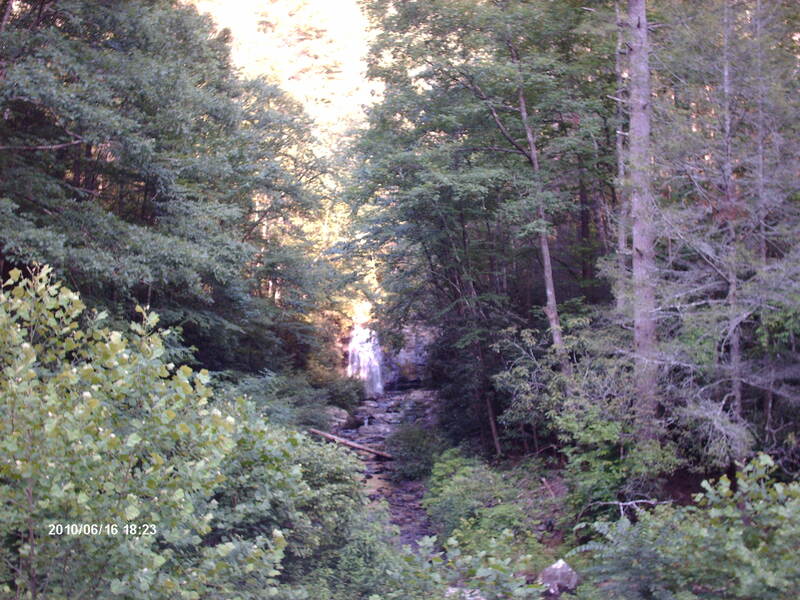 Cades Cove, Roaring Fork, and Clingman’s Dome were all closed either for maintenance or due to rock slides. 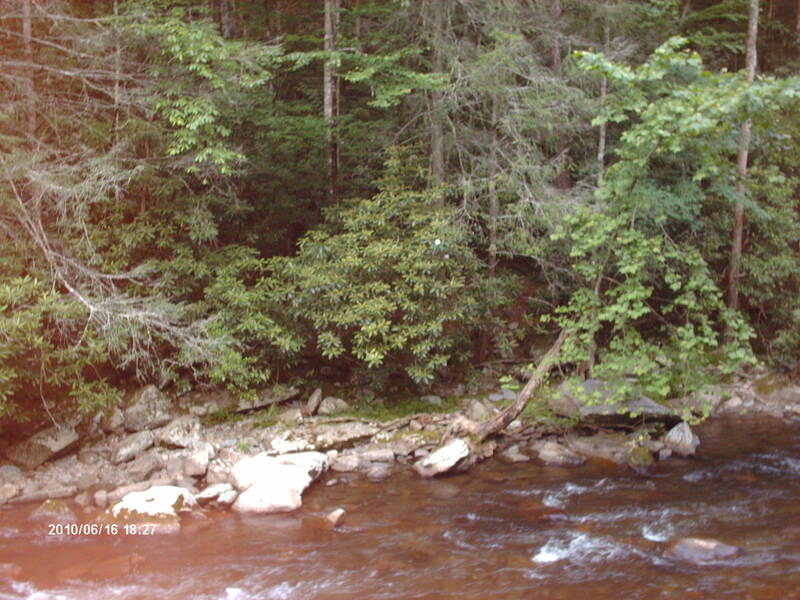 Cataloochee Valley, on the eastern side of the park where the elk were re-introduced, is remote and difficult to access. It’s at the end of a long, winding, unpaved road that’s steep and has a speed limit of 5 mph. Because my wife’s disabled, I was nervous about continuing on this road. If our car broke down, it would’ve been a disaster because she couldn’t walk back to civilization. So I turned back. I didn’t even see any interesting small mammals. Red squirrels, also known as chickarees, inhabit the park as well as chipmunks and woodchucks. None of these species live near Augusta, but alas I didn’t see them here either. I did see lots of butterflies, especially eastern tiger swallowtails. Their larvae feed on many of the tree species so common here. I also saw two different kinds of butterflies from the Pieridae family. The museum at the park welcome center had many fine stuffed specimens. The museum affords about the only opportunity for a visitor ot see animals in the park. 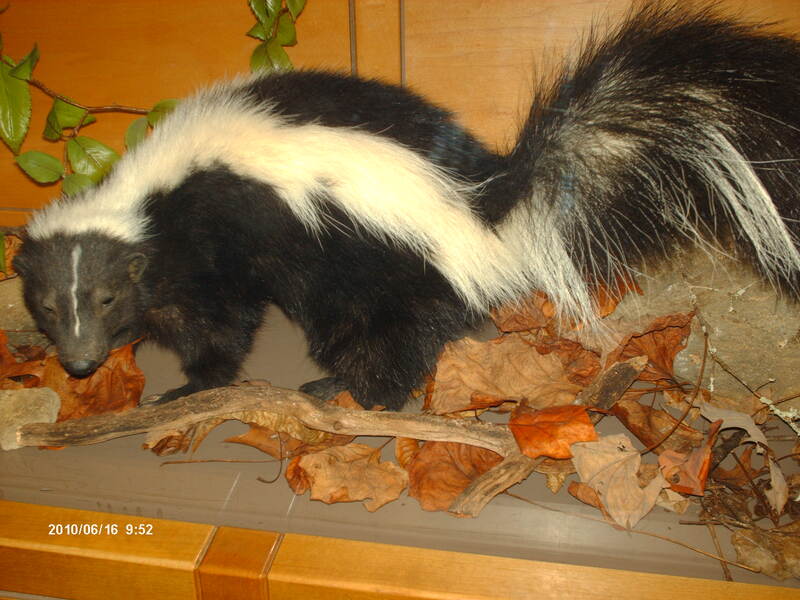 I did catch a whiff of a nearby skunk at Newfound Gap. It didn’t smell as bad as our hotel room which I nicknamed the Armpit Motel. 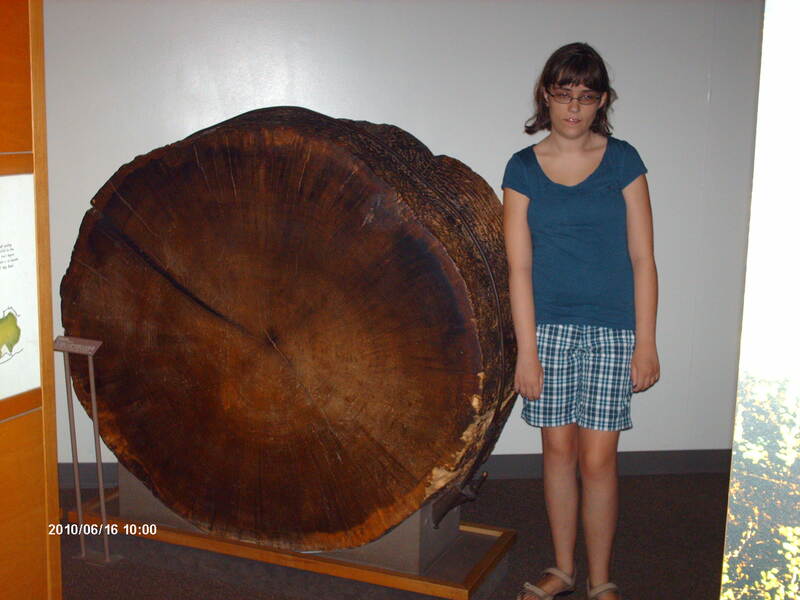 This is a tulip tree trunk. Large, mature tulip trees are a dominant tree in the park. None I saw approached this is circumference. Most people don’t realize that much of the original forest in this area was leveled by 1910. The forest now consists of second growth. 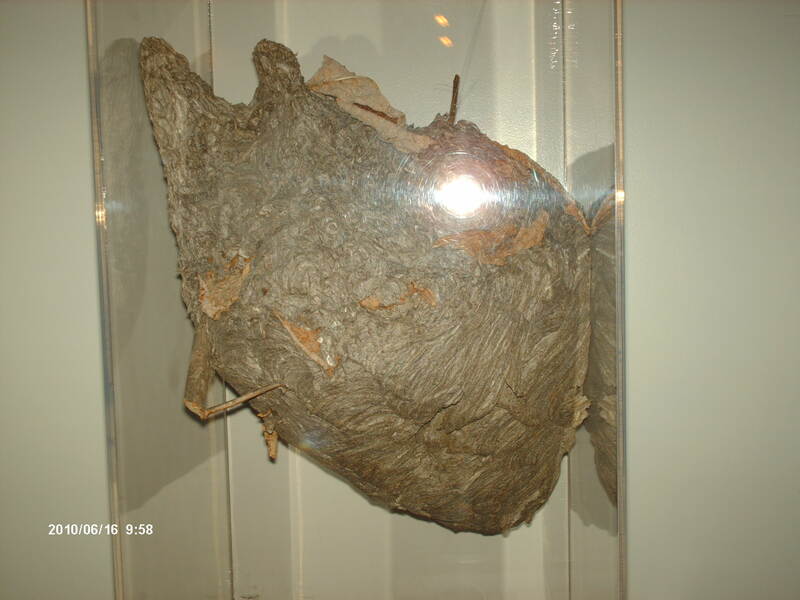 This is the biggest bald faced hornets next I’ve ever seen. They’re a marvel of insect engineering. Supposedly, this is a trout stream. The waters are clear but I saw no fish, turtles, frogs, or fish-eating birds. 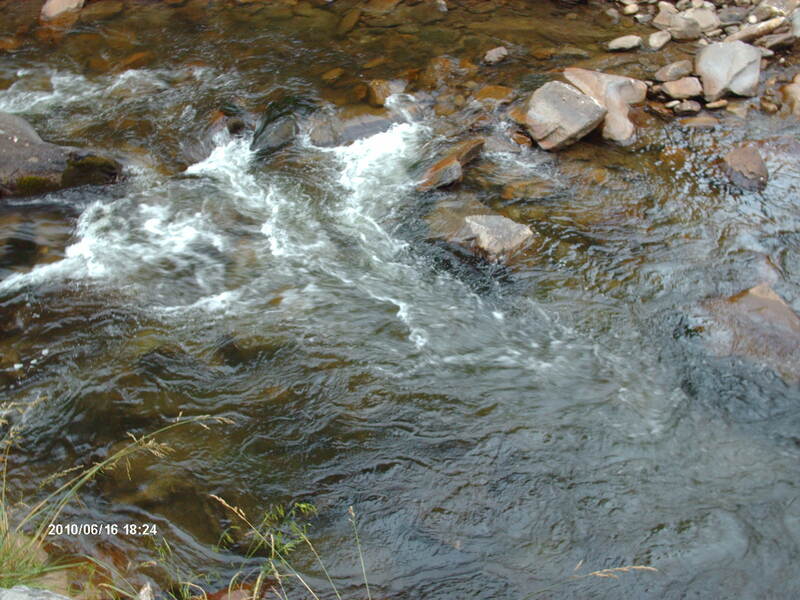 Don’t expect to catch trout here. The only trout left in the area are grown on fish farms. Admittedly, I’m a cynic. I suspected the park administration exaggerated mammal population estimates to encourage tourism. So to prove to myself that animals actually live in the park, I looked for tourist videos of wildlife in the park on youtube as evidence that they weren’t just making these figures up. I don’t have direct links but do a search at www.youtube.com for “Bear breaks into car at Clingman’s Dome,” “Cades Cove black bear,” and “Elk in the Cataloochee Valley.” Note how incredibly ignorant some of the tourists act around bears. The footage of bears tearing up logs while looking for termites, and another of one digging up a yellow jacket nest is interesting. The video of a bull elk bugling, while the rest of the herd rests behind a flock of turkeys is the kind of scene I had hoped to see. Overall, I think the park is poorly managed and underfunded. The current ratio of closed canopy forest to meadow limits quality wildlife habitat and viewing. Selective tree cutting, as practiced by native Americans, would improve both. Bison, wild horses, cougars, and wolves should be re-introduced. Were there Three Species of Bovid Roaming Southeastern North America during the Late Pleistocene? 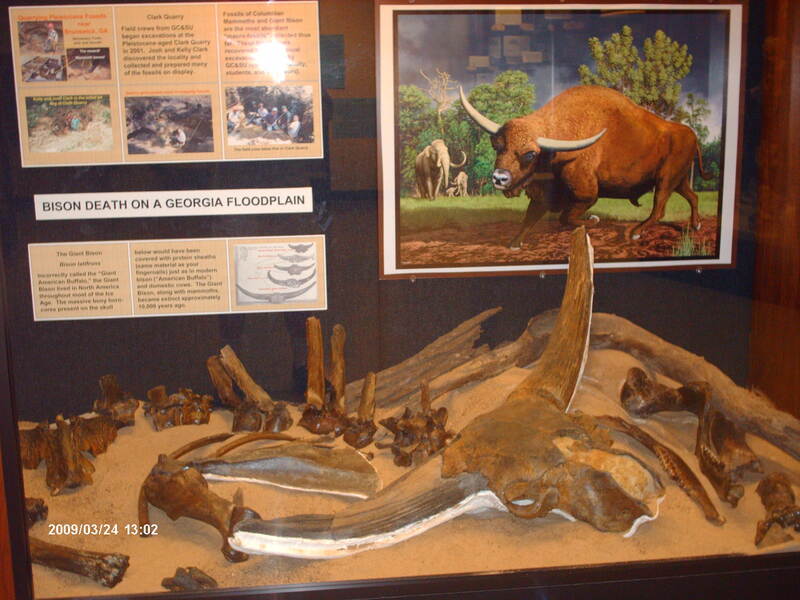 After a thorough review of the evidence in the scientific literature I’ve come to the conclusion that three species of bovid–all of them now extinct–lived in what’s now Georgia until the great megafauna extinction, circa 12,000 calender years ago. The long-horned bison (Bison latifrons) was long thought to be ancestral to a species of bison known as Bison antiquus that had horns intermediate in size between those of Bison latifrons and the modern species (Bison bison). Bison antiquus probably did evolve from Bison latifrons, but apparently there was enough differentiation in habitat preference between the two, so that long-horned bison continued to exist even after a segment of that population had evolved into Bison antiquus and spread all across the continent. On the rest of the continent Bison antiquus may have completely replaced Bison latifrons, but in the southeast both survived, and perhaps occasionally shared the same range and hybridized. This is a photo I took at the Georgia College and State Museum located in Milledgeville of a long-horned bison skull originally discovered at Clarks Quarry, Glynn County, Georgia. The carbon date on this specimen approximately equals 14,000 calender years old, a time period which is 8,000 years later than when Bison antiquus supposedly replaced Bison latifrons. Yet, specimens of Bison antiquus have been reported from Florida and South Carolina that date to about this same time, so the shorter-horned variety simultaneously inhabited the southeast as well. The species are so similar that scientist have difficulty telling the difference between the two based on fossil material, unless the skull with at least part of the horn is found intact. Teeth alone, the most commonly found fossil material, can’t be used because there’s virtually no difference between the two species. Bones posterior to the skull do differ–Bison latifrons bones tend to be larger–but the range in size overlaps too much for certain species identification. Horn size is the only definite way of telling the difference between the species. A third bovid species, the woodland muskoxen (Ovibos cavifrons), ranged over most of North America. Its fossils are more commonly found north of the Mason-Dixon line, but specimens of this species have been excavated in Lousiana, Mississippi, Tennessee, and Virginia; suggesting the southern limits of its range probably extended into the Georgia piedmont. The woodland musk-oxen was taller, thinner, and probably not as thick of fur as its living relative–the woolly musk-oxen. It’s also known as the helmeted musk-oxen because its horns were shaped like a helmet. All three were likely aggessive and dangerous animals–a real hazard for predators to attack. The two Pleistocene bison species defended themselves from dire wolves, saber-tooths, and the giant panther/lion (Panthera leo atrox), much like African water buffalo battle lions and hyenas in today’s Africa. Woodland musk-oxen likely formed impenetrable defensive perimeters similar to those of their living relatives. What could have been the reason these species co-existed here in what’s now Georgia? According to one fleeting reference, the long-horned bison may have been a beast of open woodlands, while Bison antiquus was a denizen of open plains. Woodland musk-oxen preferred high dry meadows. Though their ranges overlapped in places, the three species did have a preference for different individual habitats. I think long-horned bison thrived on the warm coastal plain savannahs of Georgia where herds of Bison antiquus (or as I prefer to call them– northern bison) occasionally intruded, but the latter preferred cooler prairie-like regions to the north. Cool dry prairie habitat spread due to fluctuations in climate related to the last glacial maximum, but the gulf stream created a warm thermal enclave, preferred by the long-horned bison, along the Atlantic coast. The warm grasslands favored by long-horned bison remained, thus they were like a relic species. Both northern bison and woodland musk-oxen were probably draught tolerant. Long-horned bison may have been more dependent on water, limiting where they could live when the climate changed to cool and arid conditions across most of the rest of the continent. Within historical times two species of bovine lived tothether in Europe and Asia. The European bison or wisent (Bison bonasus) occurred along with the aurochs (Bos taurus), the extinct wild ancestor of our domestic cattle. The former, though now restricted to deep forests, liked open grasslands; the latter preferred riverine woodlands and meadows. The aurochs was more dependent on water, a trait of cows western cattlemen are well aware of. They were less able to survive in dry habitats like bison can. They were also less able to avoid human hunters because they couldn’t travel long distances away from water. The ability to migrate long distances is what I theorize kept bison from completely becoming extinct until almost modern times when they came perilously close and would have become so, if not for human laws protecting them. When bison migrated long distances, they were able to find areas sparsely inhabited by man, until the industrial age when such refuges became rare. It’s a shame Georgia’s remaining wilderness areas no longer have even one species of wild bovine. Why? Primitive people, like modern man, loved to eat steaks, roasts, and hamburgers (which paleo-Indians made by pounding tough pieces of meat with rocks). The modern species of American bison (Bison bison) probably periodically colonized what’s now Georgia during the Holocene. Indians extirpated these herds intermittently. Europeans finally eliminated them from the state between 1760-1800 AD. Note: My next blog entry won’t be until June 23rd. It’s hard to imagine elephant-like animals as a common component of Georgia’s wildlife, but during glacial cycles of the Pleistocene, the region of what’s now Georgia and other southeastern states provided habitat for two species, and during interglacial stages was home to three. About two million years ago mammoths crossed the Bering land bridge and spread across the North American continent, replacing 4-tusked stegomastodons from their niche here, though the latter continued to thrive in South America. Mammoths were grazers, mostly subsisting on grass, and they preferred open habitats of prairie, meadow, and lightly wooded savannah. The species of mammoth prevalent in Georgia then is known as the Columbian mammoth–a different species than the more famous but less widespread woolly mammoth. Mastodons, close relatives of stegomastodons, had a different history. They too originally evolved in Africa and spread across the upper hemisphere of the world, but they’re much older as a species, having evolved during the Miocene. They became extinct in Africa, Asia, and Europe before the Pleistocene, but continued to successfully survive in North America until men invaded the continent and probably hunted them into extinction with the rest of the megafauna between 15,000 and 12,000 years ago. Mastodons occupied a different habitat and ecological niche than mammoths, perhaps explaining why both species co-existed for two million years. Mastodons inhabited wooded river bottomlands and swamps where they found lots of succulent plants to browse upon. In fact we know exactly the types of plants they ate because scientists discovered loads (more than 27 square meters) of 14,500 calender year old fossil mastodon dung in the Aucilla River of Florida. 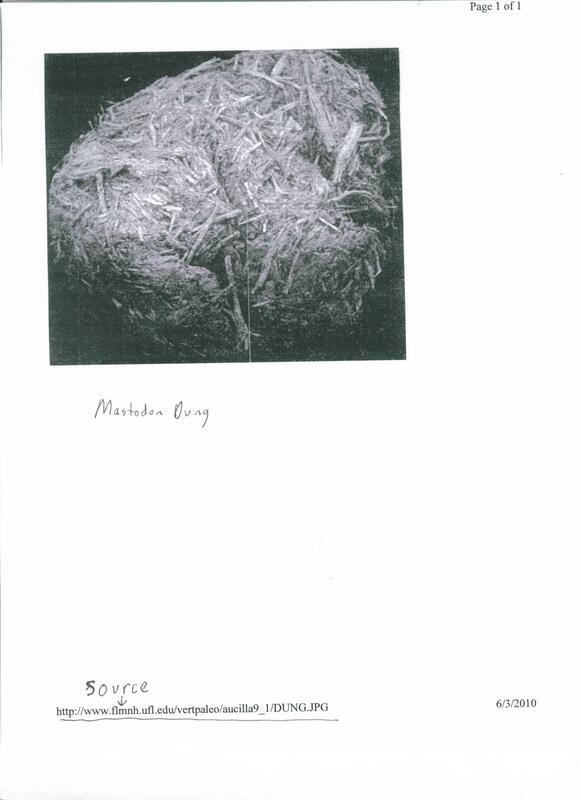 Scientists analyzed the contents of this dung and discovered that mastodons ate twigs, leaves, sedges, fruits, and aquatic plants. Their fur, a sample of which was discovered by a museum curator in Milwaukee, resembled that of beavers and otters, suggesting mastodons were a semi-aquatic animal. A diet of plants found near water supports this hypothesis. 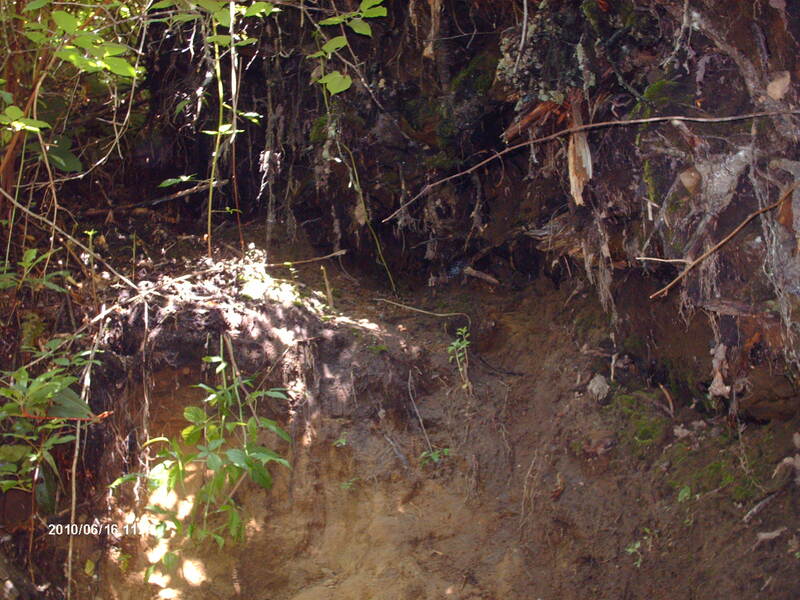 Interestingly, all but 3 of the at least 40 species of plants found in Aucilla River mastodon dung still occur in this region of Florida–obvious evidence against climate change models of extinction. Osage orange, hazlenut, and an undetermined species of goard were the three that no longer occur naturally in north Florida today. During warm interglacials of the Pleistocene, a third elephant-like species, the gompothere, expanded its range north from South America to inhabit the southeast. They probably co-existed with mastodons on the same range because they also ate browse, though they were more of a mixed feeder, eating grass as well. Evidentally, they couldn’t adapt to cold climate as well as mastodons and mammoths. I toured my backyard recently and discovered an abundance of the plant species commonly found in mastodon dung. Much to the occasional annoyance of my snake-phobic neighbors, I ban lawn mowers from my yard and allow it to grow into a jungle. Here are some photos of plants in my backyard that would provide fodder for a mastodon, if we could retrieve one from back in time. The young shoots are especially delicious for humans too when steamed and covered with butter. I think they taste better than asparagus. They soon turn bitter, so be sure to pick them young. The roots are deadly poisonous; the berries mildly so, but not for many species of wildlife. I’ve seen mourning doves consume them, and passenger pigeons must have spread pokeweed seeds through their dung like air force pilots dropping cluster bombs. Pokeweed is also known as pigeon berry because passenger pigeons were so fond of them. The massive flocks of passenger pigeons used to destroy acres of forest by overfertilizing the trees with sheets of their dung when they roosted. 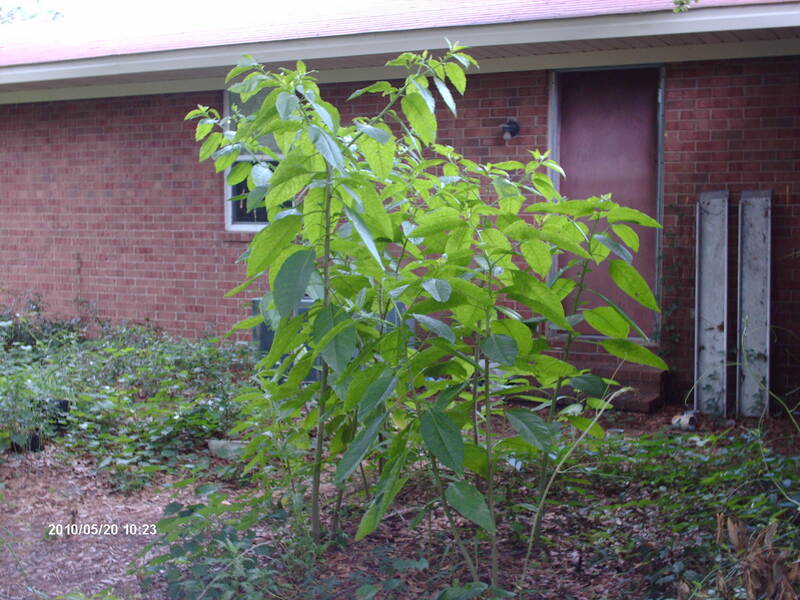 Pokeweed, along with ginseng, were the first plants to pop up in these areas. Mastodons spread pokeweed in their dung too, but probably not to the extent passenger pigeons did. 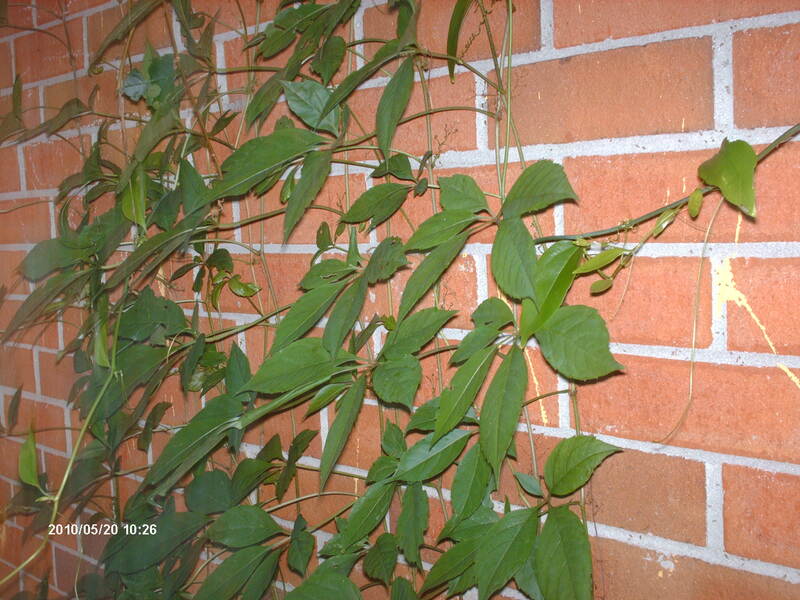 This tenacious vine is climbing my house. 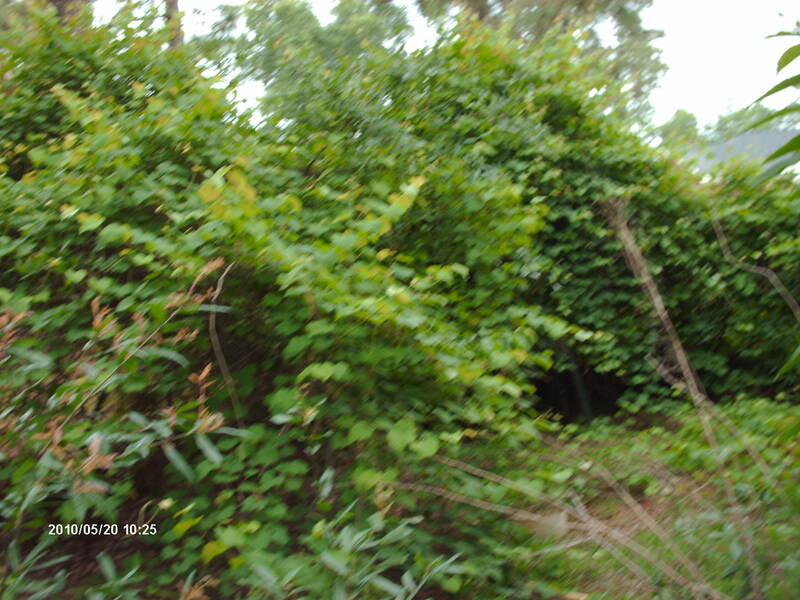 It resembles poison ivy and poison oak but is not generally considered poisonous, though many people are allergic to it. Birds spread the small fruit of this plant as well. These are my twenty year old scuppernong vines. They’re heavy producers of sweet grapes. I love grape leaves stuffed with rice or mushrooms, and they add a fruity taste to beef stew–like wine but without the sweetness, acidity, or alcohol taste. Mastodons loved them as well. Mastodons living near what’s now the Aucilla River consumed three types of oak–laurel, live, and overcup. They ate the twigs, leaves, and immature and mature acorns. Oaks thrive when pruned–saplings I cut back ever year resprout eternally. 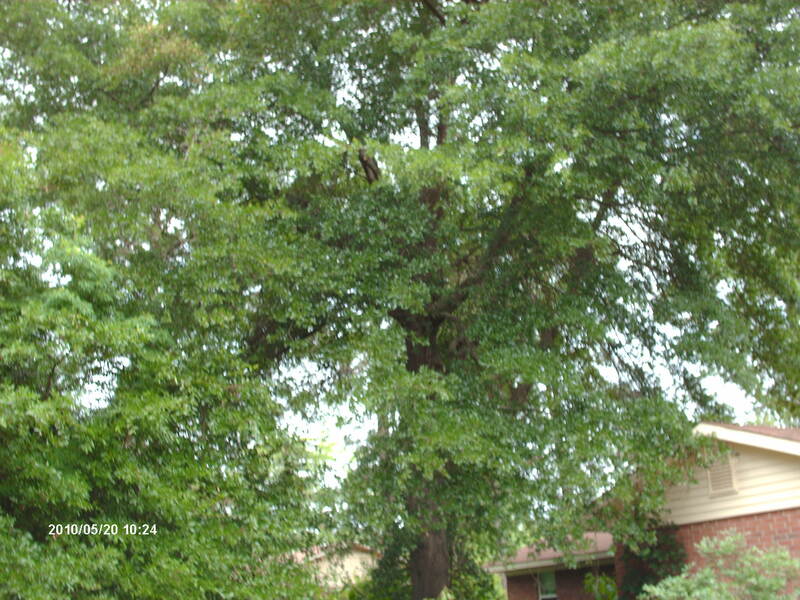 The big laurel oak in my backyard is at least 150 years old. I have dozens of persimmon seedlings in my yard. They produce lots of seeds that small animals spread in their dung. People misunderstand this fruit. They aren’t ripe until late November–it’s an early winter fruit, though the fruit on some individual trees ripens as early as late September. Unripe, they dry out your mouth, but once ripe they’re sweet and taste like perfumed dates. You are currently browsing the GeorgiaBeforePeople blog archives for June, 2010.